To use, either run the JAR file (on most operating systems) or type java -jar Volcano.jar on a console. The game is multi-player only; have one person start a server and everyone else connects. The server can run on any port but 1330 is the default. Chat doesn't work at all. If you disconnect it will break things; the server doesn't handle client disconnects well. There's only one board layout, and you can't change it. 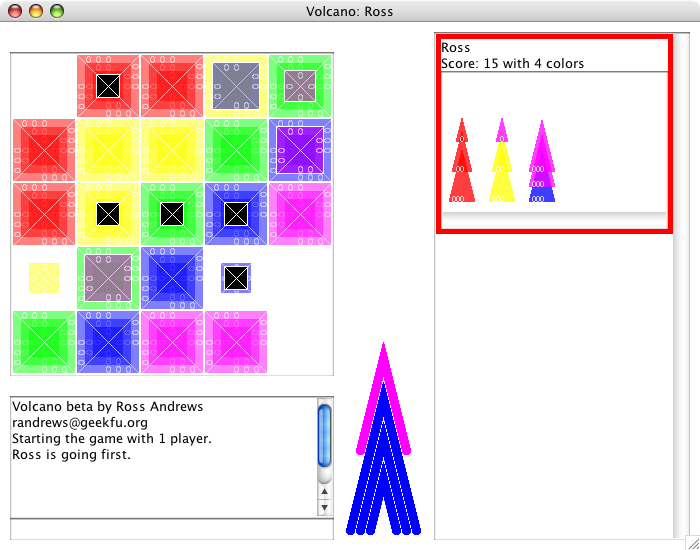 Volcano was made by Kristin Looney, and the rules can be found here. I'm not part of Looney Labs and hold no trademarks related to Volcano, Icehouse, or anything else. The rules in Spanish (soon), courtesy of William Kenzie.